We are moments away from opening the installation of the walk-through book at the San Francisco Center for the Book. In advance of that, I’d like to express my sincere appreciation and gratitude to the many talented artists who have contributed their work to this grandiose undertaking. I’m humbled to be entrusted with their work and privileged to have the opportunity to bring it together into this installation for all to see. 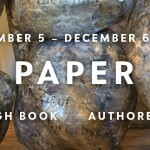 Please come experience their work at Water Paper Stone: A Walk-Through Book at the San Francisco Center for the Book from Sept. 5 through Nov. 30, 2014. You can click on most of the names below to learn more about each artist. For the summer festival in one of our local villages, La Bastide Solage, the entire Blanc family, all seven children and their children, still make enough soupe au fromage for the 400 attendees. When Marthe offered to show me how to make it, but as she was assembling it she seemed confused as to whether it looked right. It turned out she was used to making it for at least 27 people or hundreds, not just the four of us, so she had to ask Germain if he thought there was enough liquid! 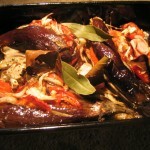 Francis Roussel served this dish for our grand festival for our work crew. 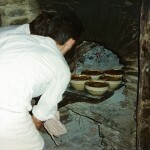 He prepared it for 80 people and used our huge bread oven to bake it. We went back to France to pick up the “pages” for a giant walk-through book that I’ve been installing at the San Francisco Center for the Book. I made 15-foot high covers for the book, my husband, Mike, contributed the spine, as he held our artist-in-residence program together. But it’s the artists, both American and French with whom we worked for over 17 years at La Pilande Basse, who were the heart of our experience there. 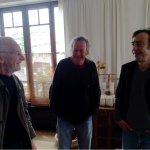 We had a grand lunch, of course, before revealing the work of eight of them at Jean-Michel’s house in Millau. Explore all the artists who contributed to Water Paper Stone: A Walk-Through Book here. 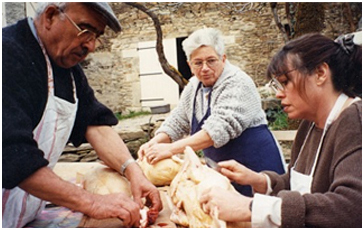 Having a garden in France involved dealing with way too much of everything en même temps: tomatoes, eggplants, onions, zucchini, garlic…all the good stuff, just too much of it. Most recipes for ratatouille sautée and stew them all together with spices until they melt together and can turn into a soupy mess, and draw groans from the dinner table after weeks of the same dish. I’m not a big fan of complicated recipes, and I love visual delights so this non-recipe is a perfect way to change up your summer excess. Quantities are not important here. When we back to France last month, we were just in time to go to the one-year anniversary mass for Marthe. She died in May 2013 after suffering a series of illnesses that had left her weak and diminished. 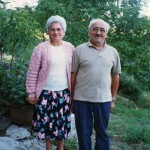 Her children, all seven of them, plus spouses, the grandchildren, and great grandchildren were packed into the small church in Coupiac, all forty-four of them. It’s been a tough year for Germain, his own health suffering. Years of hard physical labor have left his heart and body usé or “all used up,” he says. They’re repaired a heart valve, and he’s got his whole family stopping by almost daily, as well as a visiting nurse every morning who checks his medications and blood pressure. But he misses Martou, and his large hands pinch his eyes below his glasses each time he mentions her. 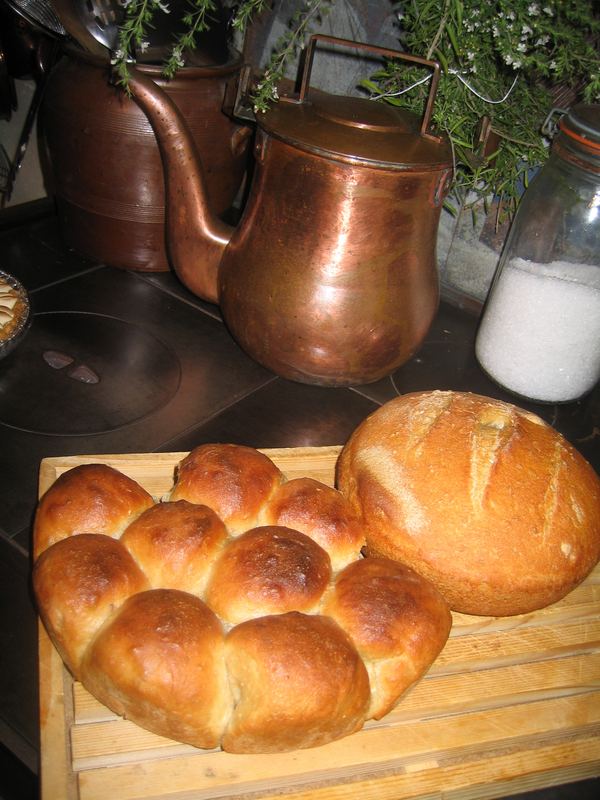 Nothing’s better than homemade bread. It doesn’t have to take all day, and you don’t even have to knead it. And there is no such thing as a failed loaf of bread. It may be a little dense or a little crumbly, but it’s homemade, and you can be sure that the next time you make it, it will be different. 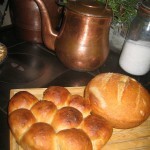 I lived in a flour mill for seventeen years and had buckets of stone-ground flour made by the miller, my husband. I made bread several times a week, and I never had a loaf turn out the same way twice. But they were all delicious. SAN FRANCISCO, APRIL 16, 2014—Seduced by the romantic notion of living a carefree life abroad, many people dream of moving to the South of France to eat, drink, and explore the countryside. Most people don’t then decide to move to France, revitalize a forgotten mill, host an artist-in-residence program, and start a new career. But that is exactly what Judy O’Shea, a San Francisco installation artist, did with her husband, Mike. 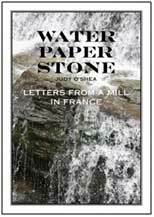 Now, O’Shea has collected her vivid journal entries and letters to her beloved sister, Linda, into Water Paper Stone, a memoir that immerses the reader in life in the heartland of France. 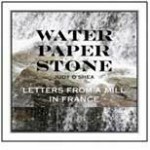 Water Paper Stone: Letters from a Mill in France is now available for purchase on Amazon.com in softcover for $17.95 and as an e-book with more than 100 photos for $13.95.